Has a closed-cell, polyiso foam core integrally laminated to heavy, black (non-asphaltic), fiber- reinforced organic felt facers. Offered in a variety of thicknesses, providing long-term thermal resistance (LTTR) values from 6.0 to 25.0. Available in 4′ x 4′ (1220mm x 1220mm) and 4′ x 8′ (1220mm x 2440mm) panels. 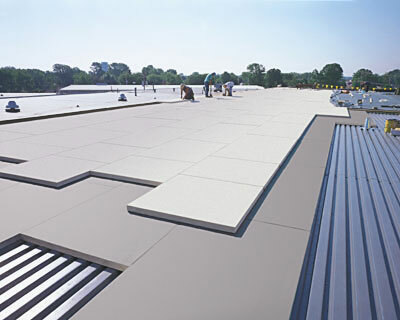 Polyiso rigid board insulation provides the highest R-Value per inch in the industry. Excellent R-Values reduce energy demands while maintaining compatibility with all types of roofing membranes and fire assemblies. Closed-cell polyiso with tri-laminate foil facers. Is used in metal roof systems, mechanically attached, and loose-laid ballasted single-ply membrane systems. CFC-, HCFC-, and HFC-free foam blowing technology with zero ozone depletion potential (ODP) and zero (negligible) global warming potential (GWP). Therm-All is an Independent Distributor, not an Employee or Agent of Atlas Roofing Corporation.